I made a $900 mistake by buying a car from Marv Jones Honda without doing enough prior research. I bought my Honda from Marv Jones Honda this year. Due to some family circumstances, I had to get a new car very urgently. I did not consider purchasing a Honda at the time; thus, I did not spend a lot of time researching Honda pricing before the purchase. When I purchase new cars, I heavily rely on information that manufactures provide online via their payment calculators. Unfortunately for me, the Build your Honda tool on the honda.ca website was down on the day when I purchased the car. Since Marv Jones had many good Google reviews, I went there with some level of trust and barehanded (without enough info that i would normally like to have before buying a new car). Several days later after getting the car, Honda.ca finally fixed their online payment calculator. I was quite upset to find out how much I would be over paying for this car. Especially considering the fact that I never had to pay more for a new car than the online financing estimate would be. (My calculation included the same model, options, NO trade-in, the same interest rate, taxes, pdi and etc.) The price that the sales person initially offered me would have cost me about a staggering $1800 more over the term of the financing (Honda Finance). After some negotiation, I ended up on settling on a deal where I am overpaying $900 dollars over the term which I would have not accepted if financing calculators on honda.ca were working properly. While I am not suggesting not to shop at this dealer, I highly recommend spending more time doing your research before stepping your foot on this dealers lot. I personally will never go back there again. Went to buy a used car, didnt realize wed get the stereotypical used salesman customer service, or lack of, going to a dealership. My wife was looking for a used car only a couple of years old. We were looking for a Civic or Fit as weve driven them in the past and know they are reliable and efficient. We looked around at their selection and found a Civic with good Kms and the features we were looking for. Therefor we discussed price and financing options. We had our one year old daughter with us and we were cutting it close to her nap time, so we knew we couldnt stick around for another 2 hours dealing with finances, insurance and ect. We decided put a deposit/hold on the vehicle so we could come back the next day when wed have more time. Later that night we received a call from the salesman asking us if we were going to purchase it, as he had another customer interested in it. My wife mentioned wed get back to him shortly with an answer. We decided we were going to purchase it, my wife called back but the salesman was busy, we were told we would receive a call back. No call was made. The next day we contacted the finance manager to get the ball rolling on purchasing the vehicle... it was sold. There was no other correspondence, a follow call stating the car was gone, asking us to come in to look at an other car, giving us ideas of another option. Disappointing and unprofessional. I brought my CRV here for service because Im getting bad gas mileage (300km per tank when its usually over 450km) and my usual mechanic suggested the dealer might be better equipped to handle this. Since theres no check engine fault, theres nothing to fix and the service advisor here was very nice about not wanting to take a ton of my cash ($125 per hour for service) to just throw parts at it in hopes of getting the problem fixed. So my problem isnt fixed but he gave me some pointers to help (watching for a check engine alert, using some gas system additives, etc). While we were waiting, my wife and I had a good cup of coffee from their machine in the customer lounge (vending machine, tv & free WiFi) and chatted with one of the sales guys about a couple of the vehicles in the showroom. He was over-the-top helpful. When it wa obvious that the cars in the showroom were a bit less than what Id like, he drove another model into an open bay so that I wouldnt have to go outside. For an older guy, he was well adept at demonstrating the technical doohickeys and gadgets. He explained every button whose function I didnt recognize. He also pointed out a couple of used models they had to save some money. Great place. Ive heard lots of things about car dealers, Ive also had some bad experiences elsewhere, but Im happy to come to this place. I bought a new Honda at Marv Jones Honda Maple Ridge and brought the car in for its first service. All that was required of them was a simple oil change. I leave my car there for the oil change and get a phone call from them about an hour later saying they have had an accident with my car. When a real mechanic does an oil change there are three safety factors one puts into place. Have the car in park, put on the emergency brake and put a block behind a tire. You only need to do one of these factors to be safe but apparently this is beyond Marv Jones Honda. 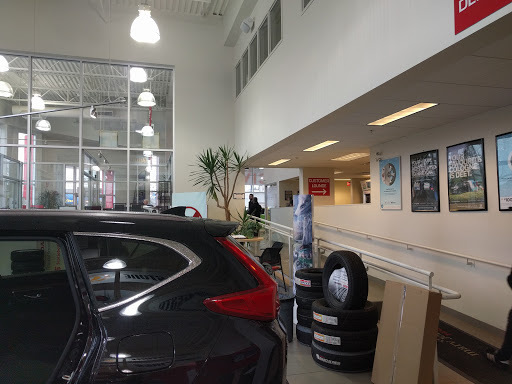 Its very insulting to be in there show room with all these awards of service excellence plastered all over the walls, when they cant even do an oil change without having a customers car roll back into a pole. Then they sent me a service notice that my locks may freeze in the winter not allowing them to work properly so I should bring the car in for the fix to be done. It was a hot June day when I brought my car in with all the door locks working perfectly. When I picked up my car after they did the lock modification half the locks no longer worked on my car. Lots more apologise and leave your car with us some more and will fix it. LOL anyway needless to say I drive my car a much further distance and get my cars routine and warranty maintenance done at a real Car repair place. We cannot express the excellent experience we had at this place. From the moment we met Jason, the Sales manager, we felt like this was a family we were destined to be apart of. From then, the service just got better and better. Neil treated us so special...we werent rushed, our situition and specific needs were met on time and his attention to detail was remarkable. And it did not stop there.... when we finally selected our vehicle, Zoie in the business office really advocated on our behalf. She kept reassuring us and pushed very hard to get us from leasing to financing our first vehicle, 2016 Honda Civic EX. The remarkable service that was given superceded our expectations. We were also veryyy indecisive on which colour to get and even at the last minute, they were sooooo patient with us. They made such a significant decision feel very comforting. When picking up our vehicle, Sandra made us feel right at home, going through our paperwork with such ease. Really a relaxed atmosphere! We never felt like just another sale, we felt like family.... I recommend them 100% to every and anyone who is nervous about their first car purchase. We were but never again will be, because we know which team to visit. We will definitely be back for our next and next and next. Thank you Guys....you made us extremely happy.